Miranda Green » Door-to-Door Mobile-Phone Sales? Editor’s Note: In an era of slow growth, smart companies seek to appeal to penny-pinching consumers while avoiding expensive upfront costs and capital expenditures. This article is the first in a series, The Austerity Economy, that highlights innovative business models that are attuned to the zeitgeist. Send your nominees for companies we should be highlighting to:business@newsweekthedailybeast.com. The slow-motion recovery is now in its fourth year. Consumer-oriented companies are reluctant to spend on marketing, and consumers are looking for ways to spend less on vital goods and services. Solavei, a startup mobile-phone company based in Bellevue, Wash., is tapping into both impulses by eschewing traditional advertising campaigns and offering cash to customers who bring in new users. “We believe the greatest advertising in the world is you and me,” said Ryan Wuerch, founder and CEO of Solavei. Launched in the beginning of October, Solavei is a 4G mobile-phone network partnered with T-Mobile that charges customers $49 per month for unlimited calling, texting, and data. But for some, the service is completely free, because Solavei pays customers for referrals. For every three people, or trio, a customer gets to join Solavei, that customer gets paid $20 dollars every month for as long as the trio uses the service. The business model is a new spin on the concept of social commerce, in which companies utilize customer-to-customer marketing instead of traditional means of advertising, like ads and commercials, to grow a brand. For Solavei, its customers function as billboards. “What do you do when you like something? You tell someone about it. 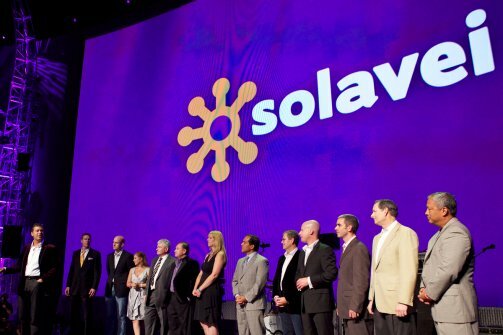 We put all the tools in your hand and you get rewarded in return,” Wuerch said of Solavei’s business model. Leanne McKenzie is one Solavei customer who is already making money off of her cellphone plan. A mother of four who lives in Middletown, Md., McKenzie joined Solavei when a friend posted about the company on Facebook. “It was the price that attracted me first. I’m a stay-at-home mom so we are a single-income family. We were paying $183 for three phones. So $49 for the service, especially when I have a teenager, was a great price for me,” McKenzie said. And trust is also an important factor. According to information compiled by Tabjuice, 90 percent of consumers trust recommendations from people they know, and 50 percent of shoppers have made a purchase based on a recommendation through a social-media network. Solavei isn’t the first company that has made stabs at utilizing social commerce to make a profit. Living Social and Direct TV are two examples of companies that use the technique, specifically through referrals. Living Social’s “Me+3” promotion encourages customers to share deals with friends and in turn get their deal for free. Direct TV offers $10 off the monthly cable bill when a customer refers a friend to the service. But unlike Solavei, Direct TV’s discounts last only 10 months. Solavei’s customer-to-customer marketing model not only helps the company gain more trusting customers, it also helps them save money. Big brands can spend billions each year in advertising. In 2010 General Motors spent $4.2 billion on marketing alone. And for mobile-phone companies, the number is just as big. In 2011 cellular companies spent $5.3 billion on global advertising. Solavei users who tell friends about the company through word of mouth or social media have the opportunity to get cellular service for free—and to earn additional money. Instead Solavei utilizes a more grassroots marketing campaign. The company has made YouTube videos for their customers to spread on Facebook, maintains its own social-media accounts, and is conducting a countrywide van tour.